* Top two drawers keep stationery and small items. * One bottom filing drawer accommodating letter-size hanging files. * Three metal handles keep it durable. * Five casters with a center caster to prevent tipping. * Eco-friendly MDF with melamine facing is scratch resistant and easy clean. 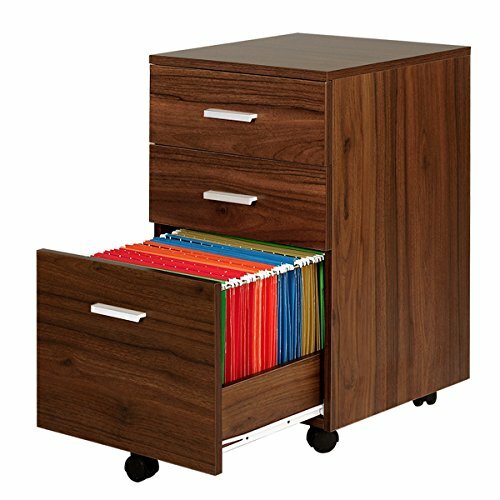 Wood File Cabinet Dimensions: 15.7" W*15.7" D*25.7" H (23.7" H without casters). Top two drawers keep stationery and small items. One bottom filing drawer accommodating letter-size hanging files. Five casters with a center caster to prevent tipping. Eco-friendly MDF is scratch resistant and easy clean,Assembly needed.